Bodhidharma is usually featured with wild hair, darker skin, an earring, and strikingly wide eyes (lidless, extremely round, sometimes blue). There are a number of stories and legends surrounding Bodhidharma. Some of that might be real; and a lot others just made up. In any case, they are very interesting. They bring forth the down-to-earth wisdom and the curt wit of Bodhidharma. I could not mention these in my post Origins of Zen School as they would not fit in there. It is said; the legends amplify facts and render them in a way they become more significant and larger in scope. That holds good for some of the stories associated with Bodhidharma. They might have sprung using him as the ideal prop to symbolize the essence of Zen. All these stories are placed in the context of the master-disciple relationship. In these stories, Bodhidharma stands for an ideal and an unreachable model; and a stern but loving teacher who guides, unerringly, to awakening. As all legends, the stories of Bodhidharma too try saying something new and unexpected. They can be enjoyed as stories and one can also read meaning into them to extract a teaching. 1. According to the Anthology of the Patriarchal Hall, around the year 527 (?) the eighth year of Putong, Bodhidharma called on the Emperor Wu Ti (502-550 A.D.) of Liang dynasty, a fervent patron of Buddhism. The Emperor was then at Jinling (today’s Nanjiang). The Emperor did not understand what Bodhidharma was saying. He was disappointed and upset. The meeting was obviously unsuccessful. Thereafter, Bodhidharma moved north, crossing the Yangtze River, floating on a reed. Now as before I regret this deeply..! Stick both legs straight out. That’s the way to escape your cage. The parrot heard and understood. It pretended to be dead. It lay on the bottom of its cage with its legs stuck out still and its eyes closed tight, not moving, not even breathing. The owner found the parrot this way and took it out to have a look. He held the bird in his hand, peering at it from the left and right until he was convinced it was indeed dead. The only thing about it was, it was still warm. But it wasn’t breathing. And so the owner opened his hand and in that instant the parrot was fully revived. It flew away and escaped its cage. [“Bodhidharma coming from the West” became a much discussed Zen phrase; and came to be regarded ‘`the essence of Zen”. 3. After travelling and teaching around the country Bodhidharma settled at Shaolin-ssu (Shorinji), a monastery on Hao-shan Mountain near Loyang, in what is now Honan province. The legend says that Bodhidharma remained seated in meditation before the wall of the Shaolin Monastery for nine years. While Bodhidharma was meditating, according to the legend, he became sleepy, and his eyelids grew heavy. In frustration, he tore off his eyelids and threw them on the floor, where they became the first tea plants—used from that time as a mild stimulant. Later, tea-drinking became a habit among the Zen practitioners, to keep awake. It also grew into aesthetic tea-ceremony. That wall-gazing was called “Pi-kuan”. The Sholin temple where Bodhidharma meditated for long years and achieved enlightenment has preserved a large rock on which, it is said, one can see the shadow of the sage – apparently it burned into the rock. 4. One of Bodhidharma’s disciples among the Shaolin monks was one Shen –kuang. One day, Bodhidharma asked Shen-kuang why he continued to turn to Bodhidharma for teachings; reprimanding him that true enlightenment is not sought through the teachings of another, but from within. “See, how well I have quieted your mind.” said the Patriarch. Hearing this instruction Shen Kuang understood the meaning of transmitting the Dharma. With that transmission of the Dharma, Shen Kuang received a new name. It was Hui K’o, “Able Wisdom,” meaning that his wisdom was abundant. Hui K’o later succeeded Bodhidharma as the second patriarch of the Cha’n school; and as the 29th master of Buddhism, in direct line from the Buddha himself. Ten thousand Dharmas return to one; to what does the ‘one’ return? Only to seek some Dharma and avoid King Yama. 5. There are a number of stories illustrating Bodhidharma’s teaching methods. He often used common objects in instructing students. He would often point at something and ask: “How do you call this?” He would do this using every available object, often switching the names in formulating a question. When a monk came to attend on him, the master pointed at the fire and said: “This is fire. But you cannot call it ‘fire,’ for I just did.” The monk could not answer. [The naming game, as it is called, is authentically Chan; and attributed to Bodhidharma. There are no correct or wrong answers here. It is in the way one reacts; and it is also contextual. The idea appears to be that he who knows will know how to answer the question without breaking the rule (e.g., one must not speak and yet must not keep silent). Further, if things are empty of that which makes a real thing real, then names do not refer. If they do not refer, then you violate the Buddhist teaching of emptiness. Therefore, one’s ability to find a way out of the dilemma is taken to be a sign of one’s understanding of the Chan teaching. The answers could come in a wide variety, ranging from simple verbal responses to acrobatics. A person may relate to what he/she believes in one of two ways: the notional way and the direct way. If a person understands it in a notional way, he will see only the verbal symbols of the proposition. On the other hand, a person who understands a proposition in the direct sense would be capable of answering semantic questions relating to the proposition as well as other types of questions. So what is the appropriate way to handle the relation between a name and the named? It seems that an all-or-nothing attitude is not the right approach. Instead, whether one has acted appropriately in using (not using) some bits of language are the issues to be decided by the teacher, depending on the context and the way the student reacts. 6.Bodhidharma presented an imprint of a beautiful lotus flower in brown sugar to a disciple. The disciple admired the imprint but would not eat it. The master then took the imprint, broke it into pieces, gave it back to the disciple and asked him to eat it. The disciple ate the pieces and enjoyed it. If you know that everything comes from the mind, don’t become attached. Once attached, you’re unaware. But once you see your own nature, the entire Canon becomes so much prose. It’s thousands of sutras and shastras only amount to a clear mind. Understanding comes in midsentence. What good are doctrines? The ultimate Truth is beyond words. Doctrines are words. They’re not the Way. The Way is wordless. Words are illusions. . . . Don’t cling to appearances, and you’ll break through all barriers. 7. 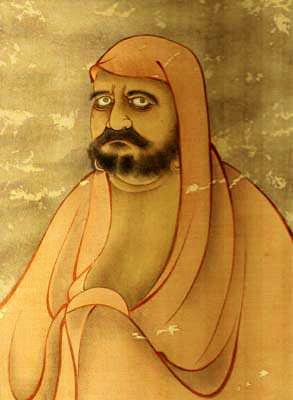 There were as many as six attempts of poisoning Bodhidharma. It is said; some scholars, jealous of Bodhidharma’s celebrity status offered him a vegetarian meal mixed with poison. Bodhidharma ate it, knowing full well that it was poisoned. He then called for a tray into which he vomited the poisonous food, which turned into a pile of writhing snakes, to the horror of those scholars. That was followed by another unsuccessful attempt; and this time with a deadlier poison. Again, Bodhidharma ate it. After he finished his meal, Bodhidharma sat atop a huge boulder and spat out the poison. The boulder at once crumbled into a heap of dust. In four more attempts, jealous people tried without success to poison the Patriarch. The cause of his death is uncertain. He may have succumbed to the final attempt. Or, he might have walked back home with a shoe in hand, as the legend says. When mortals are alive, they worry about death. When they’re full, they worry about hunger. Theirs is the Great Uncertainty. But sages don’t consider the past. And they don’t worry about the future. Nor do they cling to the present. And from moment to moment they follow the Way. 8. The martial arts of the Shaolin temple, the weapon-less fighting that later evolved into kung Fu (gong fu) traces its origin and inspiration to Bodhidharma. When Bodhidharma arrived, the Shaolin temple at Sung Shan (on Hao-shan Mountain near Loyang, in what is now Honan province) was primarily a monastery for translator-monks who poured over Sanskrit and Pali texts to translate them into Chinese. By overdoing their task, the monks had grown physically weak; and, some had even hunched. They were too weak to defend themselves against the robbers who frequently attacked the monastery, for grains. They had also grown feeble in mind; and therefore were not progressing in meditation. Bodhidharma impressed on the monks the need to be strong both in body and mind. He prescribed them a set of physical exercises, based on Indian yogic practices, which strengthened the monks’ bodies and calmed their minds allowing them to meditate with more resolve. Bodhidharma’s primary concern was to make the monks physically strong enough to withstand both their isolated lifestyle and the deceptively demanding training that meditation requires. Nonetheless, the techniques he taught also served as an efficient fighting skill. It is said, Bodhidharma initially trained the monks in the ancient Indian style of armless combat, which used mainly punching and fist techniques. It was called Vajramusti (diamond-fist) which he, as a prince, learnt in India. With that, the Shaolin style of fist fighting ch’uan-fa (literally “way of the fist”) was founded. His system of movements combined artistic and acrobatic styles; and used circular principles to redirect an opponent’s attack. Though those movements were slow and cautious, they were a form of strength. The theory behind it was to always be on guard by using the attacker’s energy and redirecting it back to him in a circle. These circular techniques, sometimes called “arcs”, allowed a student to yield to an opponent’s thrust, ultimately forcing the opponent to become unbalanced and vulnerable to multiple counters. This style was practiced as exercise and as a form of meditation. Bodhidharma’s style was eventually formalized into the martial arts style known as the Lohan (Priest-Scholar). It contained eighteen positions and hand movements. It was the basis of Chinese Temple Boxing and the Shaolin Arts, a powerful and well known system of hand-fighting. The Bodhidharma style did not, perhaps, include (open) empty-hand fights. According to legend, the eighteen positions, which he introduced, were improvised and enhanced to 170, decades after his death, by the two Shaolin monks: Ch’ueh Yuan and Li-shao. This was the basis for kung fu, which, now, is probably the best known of all Asian unarmed martial arts. The ground rules of martial arts were laid down by Bodhidharma. He prescribed that martial arts should never be used to hurt or injure needlessly. In fact, it is still one of the oldest Shaolin axioms that ‘one who engages in combat has already lost the battle.’ His Five Commandments condemned: killing, robbery, obscenity, telling lies and drinking wine. Meat eating was considered “not necessary”; but there was no commandment against that. Hundreds of years later, the emperor gave the monks meat to eat and wine to drink. This was known as “The Change of the Sixth Ancestor”. Silence was highly prized and to be strived for. Thus, the system crafted by Bodhidharma by integrating yoga for self-discipline and martial arts for self-defence gave rise to a system that was at once spiritual and combative ; the kung-fu . Monks of the Shaolin Temple specialized in kung fu have continued teaching Bodhidharma’s techniques since 539 CE. The Shaolin temple’s claim to fame came from its association with the philosophy of Cha’n. When Cha’n travelled to Japan it came to be known as Zen. Bodhidharma’s concept that spiritual, intellectual and physical excellences are an indivisible whole necessary for enlightenment fired the imagination of the Samurai warriors. And, they made Zen their way of life. 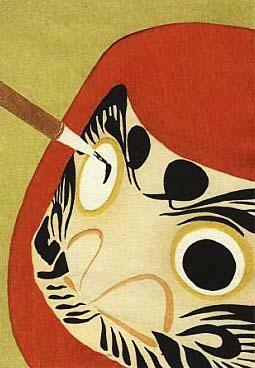 Bodhidharma, he has become a popular icon of Japanese culture, folk lore and politics under the form of Daruma (Dharma – short name for Bodhidharma). There is even a Daruma Temple at Kataoka, near Horyuuji. In Japan today, one of the most popular talismans of good luck is the armless, legless, and eyeless Daruma doll, or tumbler doll. Sold at temple festivals and fairs, such dolls are typically painted red, and depict Bodhidharma seated in mediation. When knocked on its side, the doll pops back to the upright position (hence “tumbler” doll, or “okiagari koboshi), “falling seven times and rising eight times.” (nana korobi ya oki), symbolizing perseverance through life. These Daruma dolls are also believed to protect children against illnesses such as smallpox and to facilitate childbirth, bring good harvests, ensure healthy rearing of silkworms, and generally bring prosperity to their owners. The story of Bodhidharma is truly remarkable. It is amazing how the legend and the glory of the austere patriarch hailing from Kanchipuram, deep South in India, travelled to the courts of the Emperors and the monasteries in China, to the Zen schools and temples in Japan and world over. He brought awakening and enlightenment to millions of followers; gave a new dimension and a meaning to life, learning and to martial arts. He even became a tumbling doll, a fertility saint, a talisman, a protector of children and a bringer of good fortune. Bodhidharma is truly a many splendored adorable sage. Even if a Buddha or Bodhisattva should suddenly appear before you, there’s no need for reverence. This mind of ours is empty and contains no such form. Why worship illusions born of the mind? Your mind is basically empty. If you envision a Buddha, a dharma, or a Bodhisattva and conceive respect for them, you relegate yourself to the realm of mortals. If you seek direct understanding, don’t hold on to any appearance whatsoever, and you’ll succeed. all your blogs are enriched with knowledge. but i have a question. why buddhism in its immaculate form is destroyed in india? i feel sorry and wish to revive it. thanks. that is a huge question, on which tomes have been written. buddhism was not destroyed as you said. it transformed other religions, particularly hinduism; and in the process, was transformed and absorbed into hindu practices. it did surely decline since about sixth h century but it was the sword of islam that dealt the death blow, as dr. ambedkar put it. the reasons for the decline of buddhism in india were many. the principal among them could be the dwindling patronage from the ruling class; the changes that took place within the indian society; the schisms within the buddhist faith, the widening differences between the clergy, bhikkus, and laity, and the growing corruption within the sangha; and, to end it all, the muslim invasions which had the effect of driving into extinction an already debilitated faith. we don’t know why buddhism declined in the last half of the first millenium ad; say up to sixth century. hsüan-tsang who traveled widely during the 7th century found regions where buddhism was doing well, he also found many regions where it had sharply and startlingly declined, giving way to jainism and hinduism. for instance, he found it was popular in the regions of the present-day up, sindh, parts of maharashtra (kolhapur area) and tn.but he was surprised to find its striking decline in its homeland bihar and in nagarjuna’s region ( ap) and around dhanyakataka (today’s vijayawada),bengal , gujarat and rajasthan. scholars believe that the monasteries became detached from everyday life in india. after centuries of patronage, the monasteries had amassed a wealth of endowments. life inside the monasteries was very good. so the monasteries became very selective in admitting monks to the brotherhood. the buddhism distanced itself from the common folk when it turned into elite debating society with its texts in high-class sanskrit. further, for the everyday indian, buddhism increasingly became indistinguishable from hinduism, which had undergone a transformation itself. when the muslims began their conquest of india by around 1192, they energetically set about destroying the buddhist monasteries, universities and libraries; and driving out the monks. the monasteries were so central to buddhism; its followers had nowhere to go. hinduism though it did suffer badly, could survive because it was more widespread; fundamentally a part of indian life and it was unorganized. thereafter, the bhakthi movement that followed around 12th century absorbed buddhists and buddhist influences. and before that sri shankara had restructured and re organized hinduism taking clues from buddhism. buddhism witnessed a revival during the 20th century due efoorts of several individuals and organizations. thank you. i am glad you found it interesting ; and you relished his kanchipuram connections. yes, bodhidharma was truly a remarkable person. he touched almost everyone’s life. further, for the everyday indian, buddhism increasingly became indistinguishable from hinduism, which had undergone a transformation itself. . i think thats the main reason. we treat buddha as one of the avatars so distinction disappears.———————————– buddhists are non-violent. there was no resistance against agrressive attack of islam——————————– hinduism though it did suffer badly, could survive because it was more widespread; fundamentally a part of indian life and it was unorganized.————————————- the rituals of hinduism are so many and so flexible that people are emotinally bound to the deities they worship. though hindus renouned for escaping to preserve their identities in some places they resisted the muslims militarily too . thank you for reading my responses and making some very valid observations. you are absolutely right on both counts. i could have mentioned them, but for the length of the response. yes, for the everyday indian, buddhism increasingly became indistinguishable from hinduism, which had undergone a transformation itself. the average hindu thought of buddha as a god among their gods; the buddha was worshipped by hindus as any other god. in fact, hinduism eventually construed buddha as a manifestation, or avatar, of vishnu. and, as you said, hinduism is characterized by its resilience and flexibility in approach. and, as you rightly observed,the people could emotionally relate to the various deities of hindu pantheon, which seemed to fulfill a need. at the same time,since buddhism did not define the nature of ultimate reality, ordinary people continued to worship the various devi –devathas just as their ancestors did. further, the common lay-buddhist -folk depended on hindu systems for performing life-cycle rituals .the buddhist high philosophy was confined to monks. there was no effective change in their life even when the monks and the buddhist high philosophy disappeared. another reason mentioned was, strangely, related to economy. the hindu practices somehow seemed to recharge the economy. its rituals involved all segments of the society, caused expenditure by the affluent, created jobs for others, increased production, generated incomes and carried forward the life of the community. the hindu priest could also stimulate and participate in production, for he had a good working calendar for predicting the times of plow, sowing, and harvest. he knew something of new crops, and trade possibilities..
the buddhist religion was at that time entirely maintained by various orders of monks not lay- persons; and the monks did not participate in the economic process. the buddhist monasteries, nonetheless, had to be supported and funded at all times. it would be a drain on the society, particularly in times of scarcity and distress. that is the reason that an economist observed that the value of the thoughts is to be judged by the social advance which they encourage. well, that is an economist’s point of view. as you mentioned, buddhism with its creed of non-violence and non-resistance was ill equipped to fight invaders, particularly in the north-west, the gateway to india by land route. thank you for your comments. please keep talking. another reason mentioned was, strangely, related to economy. the hindu practices somehow seemed to recharge the economy. its rituals involved all segments of the society, caused expenditure by the affluent, created jobs for others, increased production, generated incomes and carried forward the life of the community. the hindu priest could also stimulate and participate in production, for he had a good working calendar for predicting the times of plow, sowing, and harvest. he knew something of new crops, and trade possibilities..————————————— this is really a point i missed. but as a child i had observed that muslim children used to feel disappointed that the mela’s , sankrantis and glorius durga puja is not a part of their life. they had eid. but that was just one day. ——————————– my friends( muslim) daughter insists on being a part of whole-night pandal-visiting ceremonies like her hindu friends. though my friend does not like the idea, she has to submit to that childs whim.—————————————– hinduism is a celebration of emotion — hindu deities have form it is a weakness because forms can be mutilated — but it it’s strength too– it creates emotional bond between the worshiper and worshipped.